SAST Industry day:It Is Great That We Automate Our Tests, But Why Are They So Bad? Is Mutation Analysis Ready for Prime Time? Jeff Offutt has published over 180 refereed research papers, has an h-index of 63 (Google Scholar), and has received funding from many government agencies and companies. Offutt is currently co-PI on an NSF project on integrating Computer Science Standards of Learning into K-5 classrooms. He is also leading projects on making smart tests smarter and exploring the ramifications of minimal mutation. Recent projects include the Google-funded SPARC project, which created a new teaching model for CS1 and CS2 to increase scalability, retention, and diversity, while reducing cheating, and the Testing of Critical System Characteristics (TOCSYC) and PILOT projects at University of Skövde, Sweden. His current research interests include software testing, test automation, usable security, software engineering education, analysis and testing of web applications. Offutt received the Outstanding Faculty Award from the State Council of Higher Education for Virginia in 2019 and the George Mason University Teaching Excellence Award, Teaching With Technology, in 2013. He leads the MS in Software Engineering program at GMU, teaches Software Engineering courses at all levels and has developed new courses on several Software Engineering subjects, including web engineering, software testing, construction, design, usability, experimentation, and analysis. His textbook, Introduction to Software Testing (co-authored with Paul Ammann), was published by Cambridge University Press in January 2008 and is the leading worldwide textbook in software testing. Offutt was named a George Mason University Outstanding Faculty member in 2008 and 2009. Offutt is editor-in-chief of Wiley’s journal of Software Testing, Verification and Reliability, co-founded the IEEE International Conference on Software Testing, Verification and Validation (ICST), was the first steering committee chair, and was Program Chair for ICST 2009. He also has served on dozens of conference program committees and been on the editorial boards for the Springer’s Empirical Software Engineering Journal (2006-), the Journal of Software and Systems Modeling (2002-), the Software Quality Journal (2002-), and IEEE Transactions on Software Engineering (2001-2005), is a regular reviewer for NSF and several major research journals, and has been invited to speak throughout the world. He has been involved as designer, builder, and director for many software proof-of-concept research systems, including muJava, coverage analysis web apps, Mothra, Godzilla, CBat, Mistix, Albert, CoupTest, and SpecTest, which have been used by thousands of other software engineering researchers. He has invented, developed, and experimentally validated numerous algorithms and engineering techniques in software testing. Offutt has made fundamental contributions to several software testing problems, including mutation, specification-based testing, model-based testing, automatic test data generation, object-oriented testing, input space partitioning, and testing of web applications. He has also published papers on software metrics, maintenance, and software engineering education. since 2005: Full Professor (with Tenure) of Software Engineering, George Mason University. Assistant Professor 1992-1996, Associate Professor with tenure 1996-2005.
since 2002: Part-time visiting professor in the Department of Computer Science, University of Skövde, Skövde Sweden. January 2010 to January 2014: Part-time visiting professor in the Department of Computer Science, University of Linköping, Linköping Sweden. January 2000 to August 2007: Part-time Research Scientist with the National Institute of Standards and Technology’s Information Technology Lab. January 1998 to August 1998: Acting Chair of Information and Software Engineering Department, George Mason University. August 1988 to August 1992: Assistant Professor of Computer Science, Clemson University. When I was chosen as editor-in-chief for STVR, I developed its new tag line: "Useful research in building better software." This is my goal in research. Real engineers are building real software products for real people every day, and my goal as a scientist is to make that easier. I view research through the lens of the literature I grew up reading that excited my imagination to become a scientist. Science fiction tells stories that could be true if certain things happen and certain scientific advances are made. Star Trek fits this definition. Fantasy tells stories that cannot be true in our universe, assuming magic or some other different rules. Lord of the Rings is fantasy. Most research papers published in software engineering conferences and journals are fantasy, proposing ideas or techniques for which there is no path to eventual use in practice. I strive to write papers for which there is a path to use by real software engineers building real software. I strive to write science fiction. Much of my research has been in software testing, and has resulted in fundamental results in many sub-fields. I have made dozens of results in mutation analysis and testing, collectively resulting in a comprehensive engineering solution that makes mutation practical for industrial use. Many of my results are incorporated into the commercial tool Certess, built by Certitude Inc. and marketed by SpringSoft. I also developed two mutation research tools for widespread use. I helped design and was the principal developer of Mothra, which was used throughout the testing community in the 1990s and 1980s. I led the team that designed and built muJava, which is currently used by hundreds of students and researchers worldwide. With students and colleagues, I also empirically verified the coupling effect, co-invented the schema-based approach for mutation execution, invented techniques to detect equivalant mutants, empirically demonstrated that weak mutation is a viable alternative to strong mutation, developed several processes for how best to apply mutation, invented algorithms for parallelizing mutation, empirically showed that mutation is superior to several other testing techniques, most notably data flow, and developed several classes of mutation operators, including real-time testing, object-oriented connections, web software, XML, and web services. I am credited with the first model-based testing paper (in UML 1999), designing tests from UML statecharts. I also have contributed several results to automatic test data generation, a difficult topic in which most of the problems are generally undecidable, including inventing constraint-based symbolic and dynamic symobolic evaluation algorithms to generate test data to satisfy statement coverage, branch coverage, data flow coverage, and mutation coverage for unit testing; heuristics for recognizing many infeasible test requirements, and the dynamic domain reduction procedure, still one of the strongest algorithms for automatic test data generation. Many of these results were incorporated into the commercial tool Agitator, and Microsoft’s Pex uses a form of dynamic symbolic evaluation. I also have invented new methods and processes for applying input space partitioning (category-partition). Coverage critera define rules (test requirements) for designing tests. As part of my research, I, with several colleagues, have invented several new coverage criteria, including base choice coverage, prime path coverage, active clause coverage, coupling-based testing, bypass testing, and inheritance & polymorphism coverage. These included analysis and modeling techniques such as atomic section modeling and finite state machine modeling for web applications, the ping-pong alogrithm for test suite reduction, and OO analysis techniques based on the yo-yo graph. Many of these advances are used by software development companies, and many have shown up in commercial tools, often with different names. They are also taught in hundreds of software engineering courses and used by hundreds of researchers. The following topics link to web pages that list relevant papers. Below are some of my favorite publications. My criteria for inclusion are loose ... some papers are "high impact" by Google Scholar, some have high impact by subjective standards, some are landmark papers, and some simply reflect research that I really enjoyed. You can look at them chronologically (most recent paper first) or by categories. A complete list of papers is in my current CV. Nan Li and Jeff Offutt. Test Oracle Strategies for Model-based Testing. IEEE Transactions on Software Engineering, 43(4):372-395, April 2017. Lin Deng, Jeff Offutt, Paul Ammann, and Nariman Mirzaei. Mutation Operators for Testing Android Apps. Elsevier's Information and Software Technology, special issue from the mutation 2015 workshop, 2016. Mutating androids is so cool. Jeff Offutt and Chandra Alluri. An Industrial Study of Applying Input Space Partitioning to Test Financial Calculation Engines. Springer's Empirical Software Engineering journal, 19(3):558-581, June 2014. We were able to not only demonstrate that ISP helped test financial service software very well, but they let us publish openly. Thanks! Jeff Offutt,Vasileios Papadimitriou, and Upsorn Praphamontripong. A Case Study on Bypass Testing of Web Applications. Springer's Empirical Software Engineering journal, 19(1):69-104, February 2014. Being able to apply this concept to real, commercial, applications was fun and rewarding. Paul Ammann, Marcio E. Delamaro, and Jeff Offutt. Establishing Theoretical Minimal Sets of Mutants. 7th IEEE International Conference on Software Testing, Verification and Validation (ICST 2014), March 2014, Cleveland Ohio, USA. I believe this research has the potential to revolutionize mutation. Time will tell. Jeff Offutt. Putting the Engineering into Software Engineering Education. IEEE Software, Jan-Feb 2013, 30(1):96-100. This paper was an ACM "notable" paper for 2013 and sparked a lot of interesting discussion. Jing Jin, Jeff Offutt, Nan Zheng, Feng Mao, Aaron Koehl, and Haining Wang. Evasive Robots Masquerading as Human Beings on the Web. 43rd Annual IEEE/IFIP International Conference on Dependable Systems and Networks (DNS 2013), June 2013, Budapest Hungary. How often do software engineering guys publish in top security conferences? Jeff Offutt. A Mutation Carol: Past, Present and Future. Elsevier's Information and Software Technology, special issue from the mutation 2009 workshop, 53(10):1098-1107, October 2011. This was a fun historial perspective, based on a keynote talk. Gary Kaminski, Paul Ammann, and Jeff Offutt. Better Predicate Testing. Sixth Workshop on Automation of Software Test (AST 2011), pages 57-63, May 2011, Honolulu, Hawaii, USA. This is a new way to reduce the cost of mutation--a proof that some mutants subsume others. Upsorn Praphamontripong and Jeff Offutt. Applying Mutation Testing to Web Applications. Sixth Workshop on Mutation Analysis (Mutation 2010), April 2010, Paris, France. Mutating the web is fun. Plus it's Upsorn's first paper. Jeff Offutt and Ye Wu. Modeling Presentation Layers of Web Applications for Testing. Springer's Software and Systems Modeling, 9(2):257-280, April 2010. This model captures fundamental aspects of web software that are new, powerful, and risky, thus need to be tested. It was hard to get it published because reviewers didn't underestand the web and because we didn't understand how to write the paper. Nevertheless, the TR had 88 citations. Paul Ammann and Jeff Offutt. Introduction to Software Testing, Cambridge University Press, 2008. We started this book because we needed a book for our class, and finished it as a service to the community. 562 citations and counting. Jeff Offutt, Aynur Abdurazik, and Steve Schach. Quantitatively Measuring Object-Oriented Couplings. Springer's Software Quality Journal, 6(4):489-517, December 2008, doi: 10.1007/s11219-008-9051-x. I was happy to make this field a little more quantitative. Leonard Gallagher, Jeff Offutt and Anthony Cincotta. Integration Testing of Object-oriented Components Using Finite State Machines. Journal of Software Testing, Verification, and Reliability, Wiley, 17(1):215-266, January 2007. Len and I worked for years on this paper through 5 painful revisions. It is one of my two "forever papers," deep, valuable, but too complicated for most readers. Jeff Offutt, Paul Ammann and Lisa (Ling) Liu. Mutation Testing implements Grammar-Based Testing. Second Workshop on Mutation Analysis (Mutation 2006), pages 93-102, November 2006, Raleigh, NC. This concept paper let us to a new, and much broader, view of mutation testing. This led to the syntax chapter in the testing textbook. Jing Guan, Jeff Offutt and Paul Ammann. An Industrial Case Study of Structural Testing Applied to Safety-critical Embedded Software. ACM International Symposium on Empirical Software Engineering, ISESE 2006, pages 272-277, September 2006, Rio de Janeiro, Brazil. We applied CACC (sort of MCDC) to real software and found real faults, including two safety-critical faults. We need more industrial studies like this. Plus, this was my 100th published paper! Robert Nilsson, Jeff Offutt and Jonas Mellin. Test Case Generation for Testing of Timeliness. Second Workshop on Model Based Testing. pages 102-121, March 2006, Vienna, Austria. Robert's dissertation was very cool--we applied mutation to test for timeliness. Mats Grindal, Jeff Offutt and Sten F. Andler. Combination Testing Strategies: A Survey. Journal of Software Testing, Verification and Reliability, Wiley, 15(2):97-133, September 2005. Not only did this paper directly lead to the ISP chapter in our book, it has 288 citations (as of June 2014). Yu-Seung Ma, Jeff Offutt and Yong Rae Kwon. MuJava : An Automated Class Mutation System. Journal of Software Testing, Verification and Reliability, Wiley, 15(2)97-133, June 2005.
muJava has been used by hundreds researchers and students, maybe thousands. It is also one of my most cited paper (413 as of June 2014). Wuzhi Xu, Jeff Offutt and Juan Luo. Testing Web Services by XML Perturbation. IEEE International Symposium on Software Reliability Engineering, pages 257-266, November 2005, Chicago Illinois. This was one of the first papers to apply mutation to a non-executable language to generate tests. Jeff Offutt, Ye Wu, Xiaochen Du and Hong Huang. Bypass Testing of Web Applications. IEEE International Symposium on Software Reliability Engineering, pages 187-197, November 2004, Bretagne France. I am as proud of bypass testing as any invention. The paper has well over 100 citations. Steve Schach, Bo Jin, David R. Wright, Gillian Z. Heller, and Jeff Offutt. Quality Impacts of Clandestine Common Coupling. Kluwer's Software Quality Journal, 11(3):211-218, July 2003.
Who knew that common (global) coupling could appear after deployment, as the software evolves? Steve and I had a lot of fun with this project and had some fundamental results in software evolution and maintenance. Paul Ammann, Jeff Offutt and Hong Huang. Coverage Criteria for Logical Expressions. 2003 International Symposium on Software Reliability Engineering (ISSRE '03). pages 99-107, Denver, CO, November 2003. While working on the book, Paul and I got tired of the ambiguity within MCDC. So we defined a more general structure for logic-based testing, leading to the active clause coverage criteria family defined in this paper. Steve Schach, Bo Jin, David Wright, Gillian Z. Heller, and Jeff Offutt. Maintainability of the Linux Kernel. IEE Proceedings Journal: Special Issue on Open Source Software Engineering, 149(1):18-23, February 2002. This was a very controversial paper, as Linux lovers did not like the results: because of the many dependencies, Linux was hard to maintain and getting worse. Nevertheless, the facts are the facts—that's science. Jeff Offutt. Quality Attributes of Web Software Applications. IEEE Software: Special Issue on Software Engineering of Internet Software, 19(2):25-32, March/April 2002. My first IEEE Software paper. 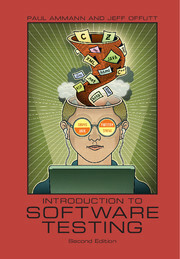 This was a "big picture view" of what's novel about web software and how it affects software engineering. Not surprisingly, it is one of my most cited papers (292 as of June 2014). Roger T. Alexander and Jeff Offutt. Criteria for Testing Polymorphic Relationships. The Eleventh IEEE International Symposium on Software Reliability Engineering (ISSRE '00), pages 15-23, San Jose, CA, October 2000. Roger taught me OO and I taught him research. When he showed me the "yo-yo" graph, it scared me senseless. This research has led me to conclude that polymorphism is too hard for most programmers and should be restricted to experts with advanced licenses and training, kind of like fighter jet aircraft pilots. Jeff Offutt and Roland Untch. Mutation 2000: Uniting the Orthogonal Mutation. 2000: Mutation Testing in the Twentieth and the Twenty First Centuries. pages 45-55, San Jose, CA, October 2000. I honestly thought this was my last mutation paper. The message was that "we have learned how to make mutation practical, now it's time for a tool builder to come in and commercialize. Here's how." Mark Hampton heard the talk and built Certess for the digital electronics community, so that part worked. But after the talk, a PhD student from KAIST named Yu-Seung Ma came to me with this crazy idea of applying mutation to OO software ... which led to muJava and a lot more mutation papers on my CV. I still haven't forgiven her. 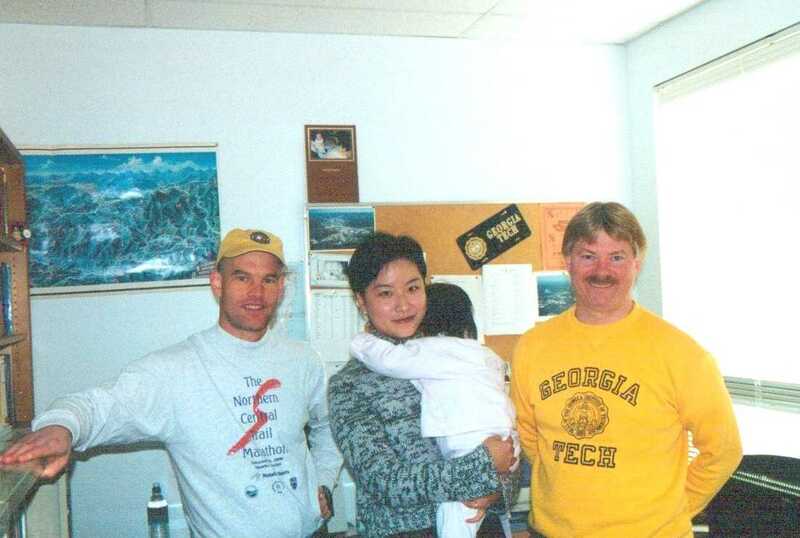 Jeff Offutt, Zhenyi Jin, and Jie Pan. The Dynamic Domain Reduction Procedure for Test Data Generation. Software Practice and Experience, 29(2):167-193, January 1999. I believe this is my best research. It also may be the most complicated. The paper was rejected four times before a reviewer wrote 10 pages explaining exactly how badly the paper was written. I owe that person a debt for this paper, and for teaching me how to write. Despite not being in a "top" journal, it has lots of citations (168 as of June 2014) and has impacted practice. Agitar's agitator was based on this paper, and although the Pex researchers never cite it, Pex uses many of the ideas that were first presented in the paper. Jeff Offutt and Aynur Abdurazik. Generating Tests from UML Specifications. Second International Conference on the Unified Modeling Language (UML '99), pages 416-429, Fort Collins, CO, October 1999. This paper was the first to design tests from UML models and has been credited with starting model-based testing. How cool is that? 460 citations as of June 2014. Jeff Offutt and Jie Pan. Automatically Detecting Equivalent Mutants and Infeasible Paths. The Journal of Software Testing, Verification, and Reliability, Wiley, 7(3):165-192, September 1997. Equivalent mutants dramatically increases the cost of mutation testing, but detecting them is a formally undecidable problem. This paper picked a future work suggestion from my dissertation: If solving constraints will result in a test that kills a mutant, then if the constraint system is unsolvable, the mutant must be equivalent. Jie Pan and I developed a set of rules to detect infeasiblilities in the constraint systems and were able to detect well over 40% of the equivalent mutants. We also realized the same approach addressed the "equivalent" problem with path coverage criteria such as statement, branch, and data flow. At the end of the project we thought of using slicing and mentioned it in future work. Several years later, Hierons and Harman applied slicing to the equivalent mutant problem, obviating this paper. Mary Jean Harrold, Jeff Offutt, and Kanupriya Tewary. An Approach to Fault Modeling and Fault Seeding using the Program Dependence Graph. The Journal of Systems and Software. 36(3):273-296, March 1997. The PDG combined Mary Jean's analysis knowledge with my mutation knowledge. We had fun, we learned a lot about writing papers, collaborating, and revising papers. I wish Mary Jean and I had written more papers together. Jeff Offutt, Gregg Rothermel, Christian Zapf, Roland Untch and Ammei Lee. An Experimental Determination of Sufficient Mutation Operators. ACM Transactions on Software Engineering Methodology. 5(2):99-118, April 1996. Jeff Offutt and Li Li. Algorithmic Analysis of the Impact of Changes to Object-Oriented Software. 1996 International Conference on Software Maintenance, pages 171-184, Monterey, CA, November 1996. Jeff Offutt and Jane Hayes. A Semantic Model of Program Faults. ISSTA 96, the International Symposium on Software Testing and Analysis, pages 195-200, San Diego, CA, January 1996. Paul Ammann and Jeff Offutt. Using Formal Methods To Derive Test Frames in Category-Partition Testing. Ninth Annual Conference on Computer Assurance (COMPASS 94), pages 69-80, Gaithersburg, Maryland, June 1994. The formal methods (Z) was not the strength of this paper. It defined the first criteria for combination strategies (category partitioning, or input space partitioning), each choice and base choice. Both are used widely in industry. Roland Untch, Mary Jean Harrold, and Jeff Offutt. Mutation Analysis Using Program Schemata. 1993 International Symposium on Software Testing and Analysis, pages 139-148, Cambridge, Massachusetts, June 1993. Jeff Offutt. Investigations of the Software Testing Coupling Effect. ACM Transactions on Software Engineering Methodology, 1(1):3-18, January 1992. How cool is it to be the first paper in the first issue of a new journal? Not only that, the paper verified an idea that was a basis for mutation, but was doubted by most researchers at the time. Rich DeMillo and Jeff Offutt. Constraint-Based Automatic Test Data Generation. IEEE Transactions on Software Engineering, 17(9):900-910, September 1991. The core of my PhD dissertation, and still my most cited paper. A paper that is still cited almost 25 years later had true impact. K. N. King and Jeff Offutt. A Fortran Language System for Mutation-Based Software Testing. Software Practice and Experience, 21(7):686-718, July 1991. Jeff Offutt. The Coupling Effect: Fact or Fiction? Third Software Testing, Analysis, Verification Symposium, pages 131-140, Key West, Florida, December 1989. Rich DeMillo, Dany Guindi, Kim King, Mike M. McCracken, and Jeff Offutt. An Extended Overview of the Mothra Software Testing Environment. Second Workshop on Software Testing, Verification, and Analysis, pages 142-151, Banff, Canada, July 1988. The first Mothra publication. Mothra changed software testing. Not only was Mothra a research testing tool that was not vaporware, it was distributed to hundreds of other researchers, with source, and is considered a precursor to open source software. Authorship is strictly alphabetical, as were all Mothra papers. Jeff Offutt and Kim King. A Fortran 77 Interpreter for Mutation Analysis. 1987 ACM SIGPLAN Symposium on Interpreters and Interpretive Techniques, pages 177-188, St. Paul, MN, June 1987. Jeff Offutt. Hints on Writing Style for Usenet. Monthly electronic posting to the Usenet newsgroup news.announce.newusers. This was a blog before blogs existed. I took a very good technical writing class as an undergraduate and wrote this in around 1983 to try to help internet posters learn to write. It wasn't peer reviewed, but it's still all over the web, despite being written a decade before the web existed. Paul Ammann and Jeff Offutt. Introduction to Software Testing. Cambridge University Press, 2008. Paul Ammann, Jeff Offutt and Hong Huang. Coverage Criteria for Logical Expressions. 2003 International Symposium on Software Reliability Engineering (ISSRE �03). pages 99-107, Denver, CO, November 2003. Jeff Offutt and Roland Untch. Mutation 2000: Uniting the Orthogonal Mutation. 2000: Mutation Testing in the Twentieth and the Twenty First Centuries, pages 45-55, San Jose, CA, October 2000. Jeff Offutt and Aynur Abdurazik. Generating Tests from UML Specifications. Second International Conference on the Unified Modeling Language (UML 1999), pages 416-429, Fort Collins, CO, October 1999. Len and I worked for years on this paper through 5 painful revisions. It is one of my two "forever papers;" deep, valuable, but too complicated for most readers. Steve Schach, Bo Jin, David R. Wright, Gillian Z. Heller, and Jeff Offutt. Quality Impacts of Clandestine Common Coupling. Kluwer�s Software Quality Journal, 11(3):211-218, July 2003. How often to software engineering guys publish in top security conferences? I have completely lost track of all the talks I've given. This list is just a few of the interesting (to me) talks that I remember. Notable article for 2013. 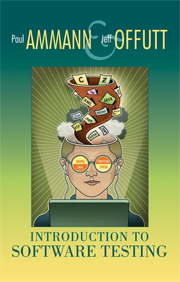 "Putting the Engineering into Software Engineering Education," IEEE Software 30(1), February 2013. Selected by ACM Computing Reviews. George Mason University Teaching Excellence Award. Finalist, Governor's Technology in Education Award. GMU SCHEV Outstanding Faculty member. I have taught for 26 years at three universities, George Mason University, Clemson University, and the Georgia Institute of Technology. Most of my courses are in Software Engineering, although I taught data structures, introductory programming, compilers, and algorithms early in my career. I have introduced a large number of innovations in terms of topics, teaching techniques, and style. At Mason, this includes developing six completely new courses, substantially revising six others, and publishing five education related papers. I also pioneered several innovations for incorporating the web into class material delivery, some of which are now used by many other college professors. My course designs for INFS 590, SWE 637, SWE 619, SWE 632, SWE 642, and SWE 763 are used by several other faculty at Mason and elsewhere. Some general information about my courses. Professors in engineering departments at research schools like Mason have an odd, sometimes contradictory relationship with teaching. I was hired for my research and tenured for research. I am recognized in my department for prolific publishing. Where does teaching fit in? To teach well, we have to enjoy teaching and care about the students. If we don't care for them, they will not care what we say. I like to teach because I am addicted to learning. I get bored if I don't learn something new every day, so I teach because it gives me an excuse to learn. This compulsion drives me to teach new subjects and to find new, innovative ways to present knowledge. I started teaching with chalk boards, moved to white boards with colored markers, then plastic transparencies, and on to power point. I first used the web to disseminate class materials and display examples, then broadcast my lectures to synchronous, simultaneous audiences outside the classroom. I then found I could use the web to extend learning beyond the temporal and spatial constraints of the classroom through interesting and informative discussions, using recorded lectures to run a "flipped" classroom, teaching asynchronously, completely on the web. When I started teaching as a 24 year old graduate student, I had a very peer-like relationship, then became more of a big brother, and as I grew older, developed more of a father-figure approach. Through all of this, one of the most enjoyable parts of teaching has been enduring relationships with people I genuinely like and respect. I grew up in an educational desert. None of my friends' parents went to college, my elementary school classes were taught to the lowest common denominators, classes were tortuously slow, and I was a constant target of bullies. 40% of my high school class dropped out and 10 of 150 started college. My geometry teacher couldn't do proofs, my chemistry class had no chemicals or even running water, and my 12th grade English class included functionally illiterate students. I graduated high school poorly educated, but hungry. Literally starved for knowledge. No matter how much I learn, that hunger has never gone away. My hunger for knowledge has never abated and it has become a passion for teaching. My goal is to impart that passion for learning to my students. I love to be the teacher I seldom had. My classes emphasize diversity, divergent thinking, and collaborative learning. Students who want to email me should read my suggestions for students making requests first. Anders Eriksson. Skövde University, co-advising with Birgitta Lindström. Model-Based Testing. Andras Markl. Skövde University, co-advising with Birgitta Lindström. Test Criteria. Some relevant advice ... part-time or full-time? Gary Kaminski. Applications of Logic Coverage Criteria and Logic Mutation to Software Testing. (2010) Primary advisor: Paul Ammann. Current position: Associate Professor at Skövde University, Sweden. Mats Grindal. Evaluation of Combination Strategies for Practical Testing. (2007) University of Skövde in Sweden, co-advised with Sten Andler and Jonas Mellin. Supaporn Kansomkeat. An Analysis Technique to Increase Testability of Class-Components (2007) (PDF of Supaporn’s Dissertation) Chulalongkorn University in Thailand, co-advised with Wanchai Rivebipoon. Robert Nillson. Automatic Timeliness Testing of Dynamic Real-Time Systems (2006) (PDF of Robert’s Dissertation) University of Skövde in Sweden, co-advised with Sten Andler and Jonas Mellin. Yu-Seung Ma. Object-oriented Mutation Testing for Java (2005) KAIST University in Korea, co-advised with Yong-Rae Kwon. Current Position: Full Professor, University of Kentucky. Current Position: Professor, Middle Tennessee State University. Aynur Abdurazik, Generating Test Data From UML Specifications, 1999. Alisa Irvine, The Effectiveness of Category-partition Testing of Object-oriented Software, (1994). Jie Pan, Using Constraints to Detect Equivalent Mutants (1994). Tracey Oakes, A WIMP Interface to Mothra (1993). David Pressley, Data Flow Analysis for Generating Statement Coverage Constraints (1992). Raad Yacu, An Improved Procedure for Generating Statement Coverage Constraints, 1991. Scott Fichter, Parallelizing Mutation on a Hypercube (1991). Stephen D. Lee, Weak vs. Strong: An Empirical Comparison of Mutation Variants (1991). W. Michael Craft, Detecting Equivalent Mutants Using Compiler Optimization Techniques (1989). Jason Emil Seaman, Using Symbolic Evaluation to Address the Internal Variable Problem (1989). Throughout my career I have focused on software engineering techniques that incorporate a large theoretical component, and also that can be used by real programmers. I emphasize empirical validations, and as such, have constructed, helped to construct, or led the construction of several working software systems. Most of these offer a proof-of-concept demonstration vehicle of theoretical concepts as well as a lab for empirical validation. Some of these (most notably muJava, Mothra and Godzilla, and also Mistix and Albert) have been used by dozens or hundreds of other researchers. The mutation testing for Java project (μJava) is a testing tool that is distributed under an open source software model. μJava is a mutation testing system for Java programs that supports the object-oriented features of inheritance, polymorphism and dynamic binding. It was built as an international collaborative effort between myself at GMU and Yu-Seung Ma at the Korean Advanced Institute for Science and Technology (KAIST), as part of her PhD work. μJava is freely available on its website. and is currently being used at hundreds of universities for research and teaching purposes. Three papers have been published about μJava, it was featured at the research tool demo session at the International Conference on Software Engineering in 2006, and many dozen of researchers and educators use μJava. This NSF-funded research project created a fully functional, multi-capability, robust analysis and coverage tool for Java. This tool allows researchers to generate a large number of coverage graphs that represent Java programs, which can then be used for test generation, test coverage measurement, metrics computation, maintenance computations, and other purposes. CBAT focused on inheritance and polymorphic relationships, as well as traditional control and data flow information. This tool was built as part of Roger Alexander’s PhD dissertation. This NSF-funded research project created an analysis tool to extract coupling relationships and measure coverage of tests according to the coupling-based test technique. This tool was built in Java for Java programs. This Rockwell/Collins-funded research project developed a tool to measure the extent to which system-level test data satisfies a set of test criteria that are defined on formal specifications and design models of the software. The tool worked with the NRL’s SCRTool, which implements the SCR specification language, and Rational Corporation’s Rose tool, which supports the Unified Modeling Language. This tool was primarily built by Aynur Abdurazik as part of her MS thesis. This research project involved approximately 12 people in the design and development of a mutation-based unit-level software testing system known as Mothra. Mothra was over 50,000 lines of C code, executed in Unix environments, and among other tools includes a parser, an interpreter, a test harness, a test case manager, and several user interfaces. While a graduate student, Dr. Offutt and Dr. Rich DeMillo (currently of Georgia Institute of Technology) were the major designers of Mothra, and Offutt was responsible for over 50% of the implementation, including the interpreter, the test harness, the test case manager, and the initial user interfaces. This work yielded many dozens of papers in refereed conferences and journals; Mothra was been used as a research and demonstration vehicle in dozens of locations. This tool was designed and built as part of Offutt’s doctoral work. Godzilla automatically generated test data for unit testing according to several test criteria, including mutation, multiple condition coverage, branch and statement. Godzilla was approximately 25,000 lines of C code, executed in Unix environments, and was fully integrated with Mothra. The software company Agitar incorporated much of the Godzilla’s test data generation innovations into their commercial testing tool, Agitator. These proof-of-concept systems all involve major modifications to Mothra to improve the efficiency of the mutation testing process. These systems provide extended functionality, use different basic algorithms, and utilize parallel hardware architectures. These projects were all implemented by graduate students as Master’s projects, using Offutt’s design and under his direction. This streamlined mutation system was built by several graduate students according to Offutt’s specification and under his direction. Two versions were built, one in C (about 8,000 lines of code) and another in Modula-2 (about 5,000 lines). IMSCU was used in several course projects at both the graduate and undergraduate level, and as a research vehicle in software metrics experimentation. In an undergraduate senior-level project-oriented course, IMSCU was used as a project template, where the class was supplied with a partial implementation and a system architectural design, and divided into five teams, each of which derived requirements for, designed, implemented, and tested an additional major subsystem. All subsystems were integrated into a complete system, which was then tested as a whole. This project involved reuse, maintenance, integration, and all phases of the software life cycle, and was managed by Offutt to provide practical, industrial-oriented experience to the students. This simplified file system was initially specified by Dr. Offutt for a class implementation project. It has been used in several classes for implementation projects, and has been implemented in several languages (C, Modula-2, Ada) by Offutt. Implementations have been used in test classes, user interface classes, and the concept has been used in formal methods classes. Implementations have also been used in several research projects. 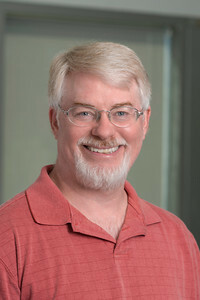 This project to build a computer algebra system for nonassociative identities was led by Dr. Jacobs of Clemson University. Offutt designed both the overall system and a command-language user interface, which were implemented by graduate students. Albert is currently used by mathematicians around the world to support research in nonassociative algebra. Offutt has been a leader at various levels. Since 2007, he has been editor-in-chief of the journal of Software Testing, Verification, and Reliability. In 2008 he and a small team (Andrews, Briand, and Baudry) created the International Conference on Software Testing, Verification and Validation (ICST), which immediately became one of the largest and most successful area conferences in software engineering. He was elected the first Steering Committee Chair and was co-Program Chair for ICST 2009. His textbook, Introduction to Software Testing (co-authored with Ammann), is the leading worldwide textbook in software testing. Offutt also is or has been on the editorial board for several journals, including TSE, EmSE, SQJ, and SoSyM. He has also helped organize over a dozen workshops and PhD Symposiums, and been on the technical program committees for dozens of conferences. Over his 26 year career, he has reviewed hundreds of papers and proposals. From 2005 through 2013, and starting again in 2015, Offutt has led George Mason’s MS program in Software Engineering. He has chaired several departmental and university committees, including a Provost’s task force for ethical computing, graduate studies committees, tenure and promotion committees, several hiring committees, and been assistant department chair and department chair (interim). He has also served on dozens of other committees at all levels at the university. Outside of academic life, Offutt is a regular speaker at public schools and local civic organizations on topics such as internet safety, web services, software quality, and empirical research (usually organized through the Mason Speakers Bureau). He is also a certified little league baseball umpire, helps coach little league teams, and coaches Odyssey of the Mind teams. Most of my consulting is with teaching & training, or with software IP issues as expert analyst and expert witness. Sometimes I write things that I want to remember or share with others. And sometimes I find things that others have written and want to save them. Is Java Bad for Students? A professional web site should not have much personal information, so this section is short. It contains things that have little or nothing to do with my professional life, but that I want to share. Most of my ancestors are Irish and moved to the US in the 1800s. 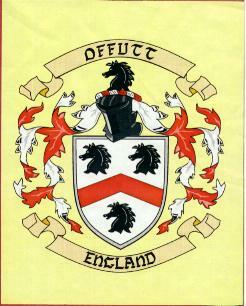 The name Offutt is English and the first Offutt (William) moved to Maryland in the 1670s. Or possibly Thomas Uffitt who moved to Maryland from England in 1632. We even found an old Offutt crest.